The foundation of any successful livestock, or for that matter human, operation is the females. Our doe herd is based on females purchased from Mike Harbour, Charles Turner, Mike Kelly and Powell-Holman. We built up to 120 does. We kidded these does out for two seasons and then culled down to 40. If they didn’t produce good kids or weren’t a good mother, then they found their way to the sale barn. We only have time to deal with good females. Nobody culls harder than I do. If I don’t like an individual’s maternal capabilities, then that goat gets a free ride to a sale barn. If you buy a female goat from us, we will tell you the history. Nobody can have fun or make money raising any species of livestock if the female doesn’t do their job. We don’t have any commercial does or registered does, just good ones. 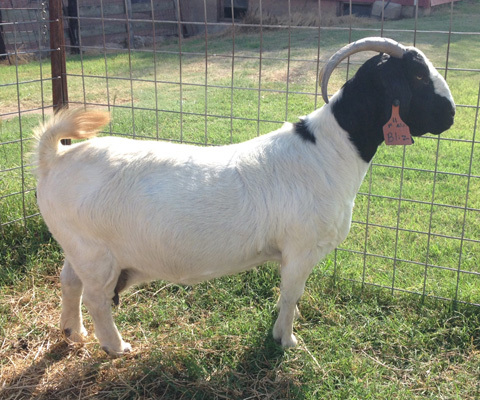 K9–X-Factor x Powell/Holman–she has raised the bronze medallion wether @ 09 OYE, Res. Div. 4 wether @ ’10 Tulsa, Res. Div. 6 wether ’11 Tulsa, Ch. Div 3 and 4th overall 2011 State Fair of OK and a premium sale wether at 2012 Tulsa. These wethers were sired by 4 different bucks. If she would have been shown, she would have been sifted due to a mouth and teat problem. But that is fine with me when they raise this kind of quality. Have we flushed her? Not enough, as that would take time and management on my part. We flushed K9 to Rumour Has It and we have 7 kids on the ground (Now minus one that committed goat suicide). Like RATT, there is a Way Cool Jr. kind of deal. Law & Order and Skippy Red Leg are our 2 bucks out of this flush. Now add, the grand doe at 2015 Woodward District was a Rumour Has It x K9 flush/bottle baby. 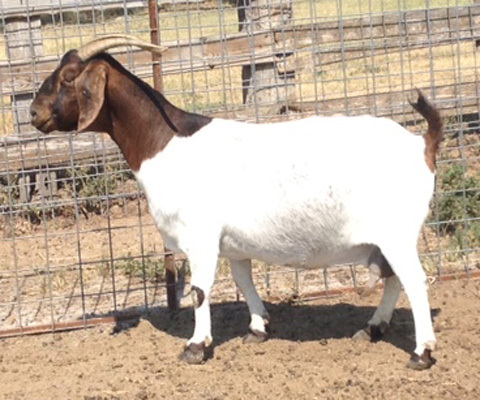 H15–one of our original Harbour does–raised the bronze doe kid @ 09 OYE, res. div. 5 wether @ ’11 Tulsa, res. div. 1 doe @ 2010 Woodward District–lots of keeper does from her. She is granddam of ch. div. 2 doe, a class winning wether and a 2nd place wether @ 2011 Tulsa. Sold to Schoovy & Sweet. K5 & Lexi–Bodog x H15–killer pair of twins that have raised numerous premium sale wethers and winning doe kids. Great mommas that raise good kids. K5 sold to Schoovy & Sweet. They have a Rumour buck son that they call Sole Survivor. Lexi just keeps working. Two of our best wethers sold in ’15 were out of a Rumour and Lexi flush. Her natural kids resulted in a June born buck prospect and a keeper doe kid. 227–also known as “MouthBite” due to her survival of a pitbull incident. Her daughters by All Jacked Up are phenomenal–MB1 & MB2. Hannah, K11, B20 and B22–all Harley daughters that have raised a pile of good ones. Champs @ KC, Tulsa, Woodward, OYE sale does and wethers. Their daughters are keepers. Add to these females to list of proven mommas–Joan, Jett & K54. X Factor Powell-Holman buck Sired the Grand Wether at the 2008 NW District Livestock Show and Champion Division 1 Doe at the 2008 Oklahoma Youth Expo. He had an untimely, early death. Fade2Black’s momma is sired by XFactor and so is the K9 doe. 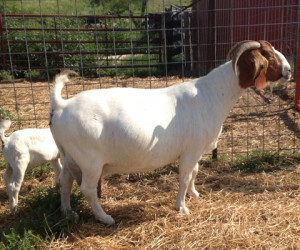 Harley Double bred Out of Bounds buck from Mike Kelly His daughters are phenomenal mothers. His daughters work best when bred back to 900 genetics–see Joe Dirt, Freak on a Leash, Rainman and Captain Morgan. Next Step Sired bronze wether 09 OYE, Ch. Div. 1 Doe 09 OYE & Captain Morgan. Now, we have B22 in a European skull mount. It’s cool. Blizz is working in WV. K9 is no longer. Great genetics. Somebody needs to update this page.